Adapt-N is an on-line tool for weather-adjusted precision nitrogen management in corn that has been available to growers in the Northeast and several Midwestern states since 2010 (http://adapt-n.cals.cornell.edu). In 2013, with an uncharacteristically wet spring, the tool successfully adapted N recommendations to account for early-season N dynamics, and further demonstrated its ability to improve farmer profits. Nitrogen dynamics in corn production are strongly influenced by weather, particularly early-season precipitation. In Northeastern and Midwestern US climates, N mineralizes from soil organic matter earlier than a corn crop is able to take it up. In a dry or normal spring, most of such early-mineralized soil N remains available to a corn crop (Figure 1a), so that growers can reduce N inputs without yield loss as demonstrated in 2011-2012 (Moebius-Clune et al., 2013a). Figure 1. Early-season N dynamics in corn systems. a) N in organic matter (OM) begins mineralizing before corn is ready to take it up, and contributes significant amounts of nitrogen for crop uptake in normal to dry years. b) In a wet spring, early-mineralized N is easily lost during this critical time period, leading to later-season N shortages if not accounted for with additional sidedressed N. c) Applying N fertilizer or manure early increases the risk of large losses. However, many growers apply the bulk of their nitrogen inputs before or at corn planting. This means not only that they lose the opportunity to reduce inputs in-season after a dry spring, but that they face significant risk of profit loss due to wet weather. 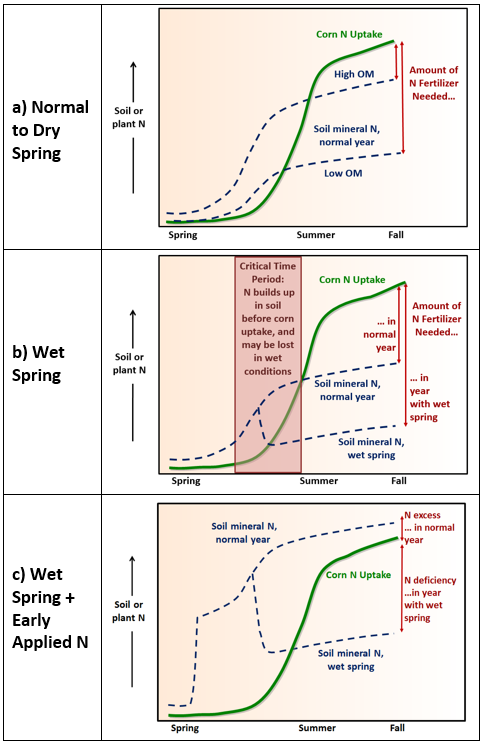 Significant N loss of both early-mineralized and early-applied soil N occur during wet spring weather (Figure 1b and c). N rates must then be adjusted in-season when these losses can be accounted for, in order to maintain corn yield potential. Adapt-N provides such site-specific in-season N sidedress recommendations. It uses a well-calibrated computer model and information on soil and crop management, along with real-time, high-resolution weather data, to account for a location’s conditions. It also provides insights on soil nitrogen status, gains and losses, and crop growth stage through simulation outputs. 1. Do Adapt-N simulations of N losses in wet-spring conditions lead to weather-adaptive N recommendations that are agronomically and economically beneficial to farmers? 2. How do the model’s recommendations affect environmental N losses in a wet season? We completed 20 replicated strip trials on commercial and research farms, 11 in New York and 9 in Iowa during the 2013 growing season. Trials were conducted in grain and silage corn, in varied tillage systems, with and without manure application, with previous crops of corn or soybean (Table 1). Most participants applied small amounts of starter or preplant N, with the majority of total grower rates applied at sidedress. Sidedress treatments involved at least two rates of nitrogen, a “Grower-N” rate based on current grower practice, and an “Adapt-N” rate based on a simulation run just prior to sidedressing. Table 1. Background information on 2013 on-farm strip trials implemented in NY and IA to compare current Grower N application rates with rates recommended by the Adapt-N tool. Growers in IA and NY implemented field-scale strips with 2 to 7 (usually 4) replications per treatment. In several trials (23-25, 27, 61, 62) treatment replicates were reported as composite harvest values due to time and equipment constraints. Yields were used as measured, regardless of statistical significance, since the statistical power to detect treatment effects is inherently low for whole-field strip trials, but averaging across many trials provides good statistical power for assessing Adapt-N performance. Prices of $0.50/lb N, $5.00/bu grain, $50/T silage were used. (Prices varied across implementation areas, but generally were close to a 10:1 price ratio). Operational costs of sidedressing ($8/ac) were accounted for where only one of the treatments was sidedressed. Agronomic, economic, and simulated environmental outcomes of these trials were used to assess Adapt-N performance. 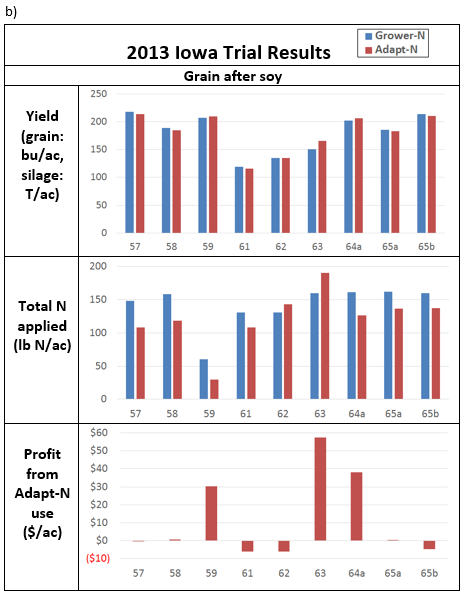 Agronomic and economic comparisons between Grower-N and Adapt-N treatments for each trial are provided for NY and IA trials in Figure 2, and as averages for agronomic, economic, and environmental performance in Table 2. In 2013, in contrast to previous years, Adapt-N rates were higher than Grower-chosen sidedress rates in 73% of NY trials, because the most extreme rainfall occurred primarily after corn planting, in June and early July, when large amounts of mineralized N and early applied N were vulnerable to losses. In Iowa, however, Adapt-N rates were higher than Grower-chosen rates in only 22% of trials, despite the wet spring, because the most extreme rainfall occurred in May and early June, followed by fairly dry conditions in some of the user area. At that time, relatively less of the potentially available N from organic matter had mineralized. The largest losses thus occurred where corn was planted early and preplant N fertilization was high (up to 110lb/ac, trial 63), prior to extreme rainfall. This was only the case in a small number of trials. Those who sidedressed the majority of their N in June were able to avoid the extreme losses. 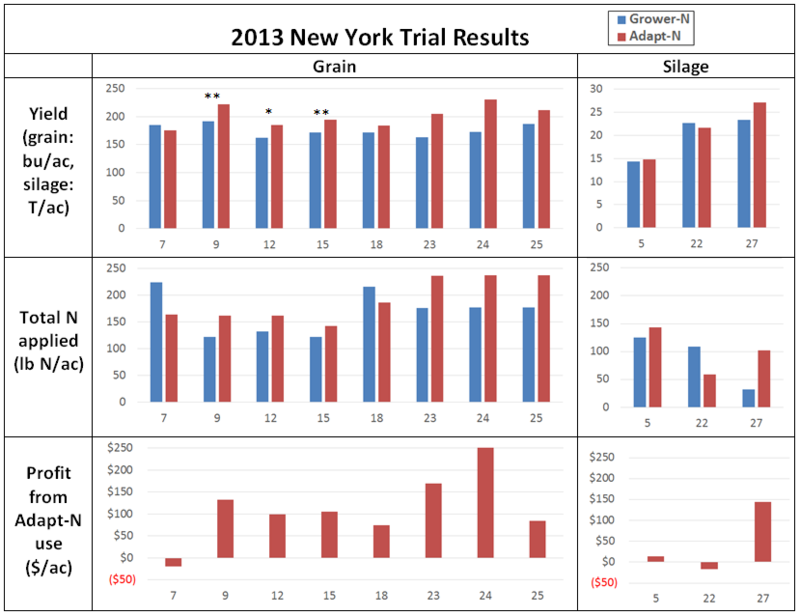 Averaging all 20 trials conducted in NY and IA in 2013, total fertilizer applied and environmental losses did not change, while yield increased by +11 bu/ac, and profits increased by $53/ac. NY trials. Adapt-N recommended increased sidedress rates over the grower’s normal practice in 8 out of 11 NY trials. The difference between Adapt-N recommendations and grower practice (A-G) averaged +20 lbN/ac (-60 to +70 lb N/ac). Yield increased on average by +21 bu/ac (-10 to +58 bu/ac; silage reported as grain equivalent: 1 T silage = 8.14 bu grain). In all cases where Adapt-N recommended a fertilizer increase, higher rates resulted in increased yields and profits. Overall, profits from Adapt-N recommendations increased in 9 out of 11 trials (82%), ranging from -$20 to +$252/ac with an average increase of $94/ac. Despite significant fertilizer increases, simulated total losses of N over the season (through 12/31/2013) averaged only 8 lb N/ac higher in Adapt-N versus Grower strips (Table 2). Post sidedress losses occur if sidedress N is applied before the crop is large enough to prevent wet soil conditions through high transpiration rates, or if excess N remains at the end of the season. Most of the additional fertilizer recommended by Adapt-N was taken up by the crop after sidedressing, while N applications and losses were reduced in 3 of the trials. In two trials where profit losses did occur, we suspect that the combination of inadequately drained, compacted, poorly aggregated soils and heavy rains caused higher losses than simulated by the model. Success stories from two growers in particular can be highlighted. Grower Arnold Richardson, working with Keith Severson of CCE Cayuga County, saw significant profit gains of over $100/ac on average from Adapt-N use this year (see Case Study in this volume, http://blogs.cornell.edu/whatscroppingup/?p=759). Dave DeGolyer of Western NY Crop Management Association established several trials of rescue N applications in July with growers Donn and Chad Branton (23-25, Fig 2). The Brantons’ standard N management places nearly all N fertilizer in a deep slot with stabilizer at planting. However, this year demonstrated that such fertilizer is vulnerable to losses during heavy rains despite stabilizer. Adapt-N indicated that more N was needed, even though enough would have been available in a normal year (Fig 1c). By sidedressing an additional 60 lb N/ac, the Brantons saw increases of 25, 42, and 58 bu/ac in three trials and profit gains of approximately $79, $164, and $246/ac due to avoided yield loss. The Brantons have decreased their preplant N applications this spring, and plan to use Adapt-N-informed sidedress rates provided by WNYCMA. IA trials. Despite the wet spring, Adapt-N recommended fertilizer rate reductions from grower’s normal practice in 7 out of 9 IA trials, in part because most participating IA growers were planning to apply the majority of their N at sidedress. The difference between Adapt-N recommendations and grower practice (A-G) ranged from -40 to +30 lbN/ac with an average change of -19 lb N/ac. Yield changes due to Adapt-N use ranged from -4 to +14 bu/ac with an average of +1 bu/ac. Profits increased on average by $12/ac, ranging from -$6 to +$57/ac, with increases due to Adapt-N in 3 trials, no change ($0 to $1/ac) in 3 trials, and decreases in 3 trials. Simulated total N losses over the season (through 12/31/2013) were lower in Adapt-N versus Grower strips (-9 lb N/ac on average). Similarly to NY results, small profit losses in a few trials with reductions in N rates are likely due to the extreme wet conditions for which the model had not yet been field tested. Improvements in model handling of drainage have been in progress for the 2014 version of Adapt-N. Overall, the fact that Adapt-N was able to decrease N inputs even after such a wet spring without significant yield loss in these 6 trials (-1 bu/ac on average) indicates that Adapt-N accounted for losses successfully, and can inform much more significant N input reductions in Iowa during more normal or dry years, as demonstrated by our 2011 and 2012 trials, when growers plan on sidedressing. It should also be noted that predominant practice of IA growers at this time is to apply N in the fall or spring prior to planting. Such growers would have seen results most like trial 63 in IA, and trials 23-25 in NY (Figure 2), where additional N was needed to make up for rain-induced losses, with increased profits above $50/ac likely. 2013 on-farm testing in NY and IA further demonstrated the monetary and environmental value of using Adapt-N’s weather-adjusted recommendations. Environmental losses due to Adapt-N recommendations in 20 trials, on average, did not increase over grower practice in the wet 2013 season. Yields increased by 11 bu/ac on average (21 bu/ac in NY, 1 bu/ac in IA). Profits increased by $53/ac ($94/ac in NY, $12/ac in IA). In 75% of trials Adapt-N increased or maintained profits compared to grower practice. The model’s ability to handle the impacts of poor drainage has been further improved for 2014. 2013 results demonstrate the value of site-specific, adaptive recommendations provided by Adapt-N. The tool’s site-specific recommendations successfully identified opportunities for N input reductions where possible, and N input increases where agronomically necessary to maintain yield potential following a wet spring. Results, especially in IA, conservatively estimate possible profit gains in a wet year, because most collaborating growers sidedress the majority of their N. Profit were highest when compared to more common grower practices of large or total preplant applications. This third year of on-farm testing further confirms the significant advantages growers have when they apply the majority of their N at sidedress time, when economically optimum N rates can be better estimated. Acknowledgements: This work was supported by funding from the NY Farm Viability Institute, the USDA-NRCS Conservation Innovation Program, the International Plant Nutrition Institute, McKnight Foundation, and MGT Envirotec. We are grateful for the cooperation in 2013 field activities from Keith Severson, Joe Lawrence, Anita Deming, Harry Fefee, Kitty O’Neil, Mike Hunter, and Brent Buchanan of Cornell Cooperative Extension, Bob Schindelbeck of the Cornell Department of Crop and Soil Sciences, Mike Davis at the Willsboro Research Farm, Dave DeGolyer, Dave Shearing and Jason Post at Western NY Crop Management Association, Eric Bever and Mike Contessa at Champlain Valley Agronomics, Eric Young at Miner Institute, and Peg Cook at Cook’s Consulting in New York, and from Shannon Gomes, Hal Tucker, and Frank Moore at MGT Envirotec. We also are thankful for the cooperation of the many farmers who implemented these trials on their farms. Moebius-Clune, B., H. van Es, and J. Melkonian. 2013a. Adapt-N Uses Models and Weather Data to Improve Nitrogen Management for Corn. Better Crops Vol 97:7-9. [URL verified 5/16/14]. Moebius-Clune, B., M. Carlson, H. van Es, and J. Melkonian. 2013b. Adapt-N Proves Economic and Environmental Benefits in Two Years of Strip-Trial Testing in New York and Iowa. What’s Cropping Up? blog. [URL verified 5/16/14]. Moebius-Clune, B., M. Carlson, H. van Es, and J. Melkonian. 2013c. Adapt-N Increased Grower Profits and Decreased Nitrogen Inputs in 2012 Strip Trials. What’s Cropping Up? blog. [URL verified 5/16/14]. Moebius-Clune, B., M. Carlson, D. Moebius-Clune, H. van Es, and J. Melkonian. 2013d. Case Study – Part II: Donald & Sons Farm Implements Adapt-N Rates on Whole Farm, Saves Money and Environment. What’s Cropping Up? blog. [URL verified 5/16/14]. Moebius-Clune, B., H. van Es, and J. Melkonian. 2012. Adapt-N Increased Grower Profits and Decreased Environmental N Losses in 2011 Strip Trials. What’s Cropping Up? 22. [URL verified 5/16/14]. Ball, M., B. Moebius-Clune, H. van Es, J. Melkonian, K. Severson. 2014. New York Farm Delves Deeper with Adapt-N. What’s Cropping Up? blog. [URL verified 6/2/2014].